From the beginning of 1947 through June 1948, Allied occupation stamps were issued for general usage throughout the American, British, and Soviet occupation zones. These Allied general issues, in most of the major catalogs, follow right after the last of the Germany - Third Reich catalog listings. The two stamps shown above (Mi. #941-42, Sc. 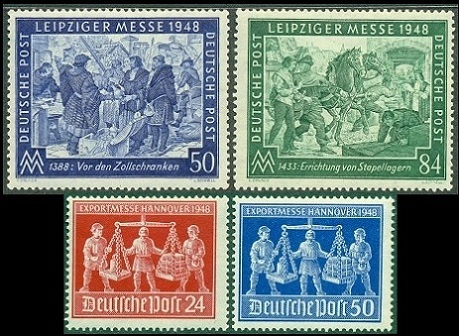 #B296-97) were issued on March 5, 1947 to publicize and fund the 1947 Leipzig Spring Fair. These stamps were beautifully engraved on white paper with a diagonal zigzag lines watermark. The two designs feature "Leipzig Proclaimed a Market Place" in 1160 and foreign merchants displaying their wares in 1268. The Leipzig Fair is a semi-annual export exhibition that dates back to Medieval times. The twenty-one new definitive stamps shown in the images above (Mi. #943-62, Sc. #557-77) were all issued between March 1947 and February 1948. The Pfennig denominations are all typographed and the Reichsmark denominations are all engraved. 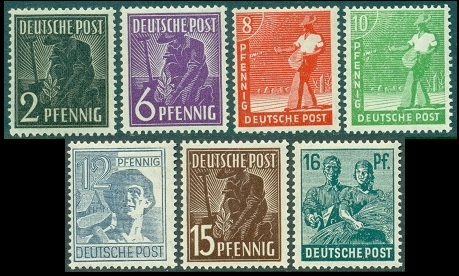 All of these stamps were printed on paper with a multiple DEUTSCHEPOST watermark. 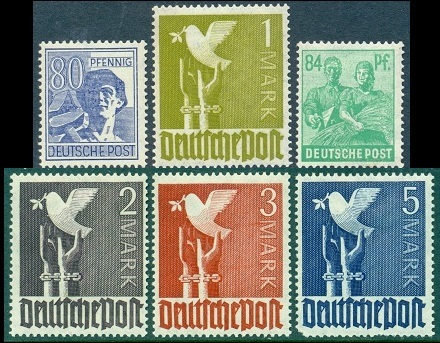 These new definitives feature five new designs, which are planting a tree, a sower, a laborer, reaping wheat, and an allegory of "Germany Reaching for Peace" (dove). The artistic influence of the Soviet Union is evident in the designs for these new Allied occupation stamps. 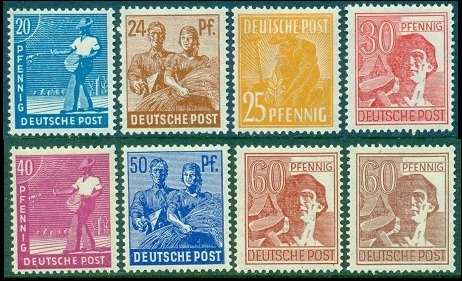 In fact, the "reaping wheat" design was used again in the 1950's for the Five Year Plan definitives of the German Democratic Republic. These definitives would also be overprinted later for use in the Bizone and in the Soviet occupation zone. The two stamps shown in the top image above (Mi. #963-64, Sc. 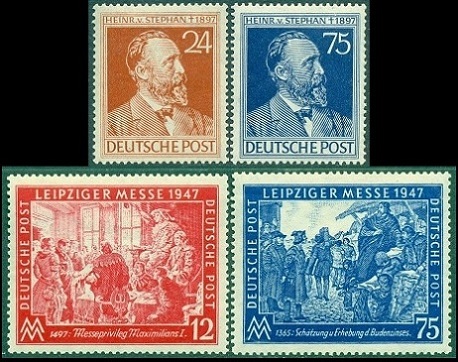 #578-79) were issued May 15, 1947 to commemorate the 50th Anniversary of the Death of Heinrich von Stephan, the first postmaster general of the German Empire and the founder of the Universal Postal Union. The two stamps shown in the bottom image above (Mi. 965-66, Sc. #580-81) were issued on September 2, 1947 to publicize the 1947 Leipzig Fall Fair. This Fall issue was printed on paper with a multiple DEUTSCHEPOST watermark. The two designs feature "Holy Roman Emperor Maximilian I" granting the "Leipzig Charter" in 1497 and "Estimating and Collecting Taxes" in 1365. The two stamps shown in the top image above (Mi. #967-68, Sc. #582-83) were issued on March 2, 1948 to publicize the 1948 Leipzig Spring Fair. This Fall issue was printed on paper with a multiple DEUTSCHEPOST watermark. The two designs feature merchants at a customs barrier in 1388 and arranging stocks of merchandise in 1433. The two stamps in the bottom image above (Mi. #969-70, Sc. #584-85) were issued on May 22, 1948 to publicize the 1948 Hannover Export Fair. The designs feature a Medieval sculpture depicting the weighing of goods for export. The two stamps were issued together in the same sheet, so they can be collected individually or in pairs. When the German currency reform was implemented in the Western occupation zones in June, the Soviets declined to participate. Thus, all subsequent issues for the American and British occupation zones will be found in the Bizone link section, and those for the Soviet occupation zone will be found in the Soviet Zone link section.